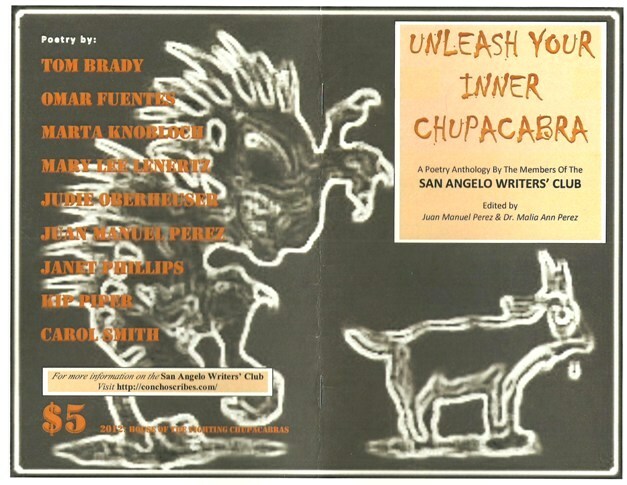 Unleash Your Inner Chupacabra is a “poetry anthology” by the members of the San Angelo Writers’ Club, and was edited by award winning poet Juan Manuel Perez and photographer/writer, Dr. Malia Perez. Most of the poems in this book remind me of Wallace Stevens’ 13 Ways of looking at a Blackbird. They have the same, Zen-like quality. As Juan Manuel Perez mentioned, “El chupacabra is whatever you want to believe it is. El chupacabra has become the epitome of the Latino bestiary as much as Bigfoot or the Jersey Devil is to Americana.” I agree. Two, white, burning orbs appear. It’s the eyes that leave you as you finish this book about the Bigfoot of Latin America, this stranger at the end of the horizon, just beyond the streetlight…watching. It’s enough to make you want to read this poetry anthology from cover to cover. 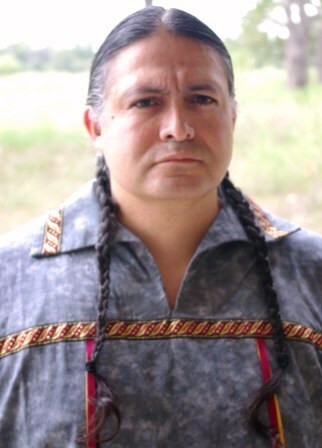 Juan Manuel Perez, a Mexican-American/Texas poet of indigenous descent (Purapecha/Otomi), is the author of Another Menudo Sunday (2007), the e-book O’ Dark Heaven: A Response To Suzette Haden Elgin’s Definition Of Horror (2009), and WUI: Written Under The Influence Of Trinidad Sanchez, Jr. (2011), plus six poetry chapbooks. He is also a member of the San Antonio Poets’ Association, the Poetry Society Of Texas, the San Angelo Writers’ Club, the Horror Writers Association, the Alamo Area Poets Of Texas, the Writers Of The Rio Grande, Texas Association of Creative Writing Teachers, and the Gulf Coast Poets. 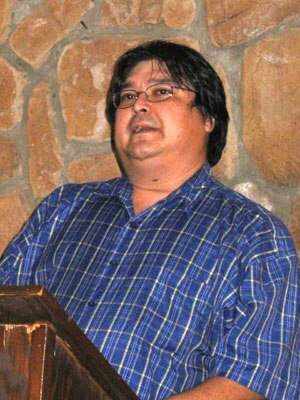 Juan is the 2011-2012 Poet Laureate for the San Antonio Poets’ Association. 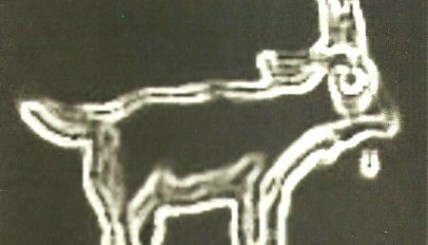 He is also known as the Original Chupacabrista (a poet writing heavily about the legend, myth and lore of the mysterious “Chupacabra”) and has been called a true Poet Of The Southwest. He has been a featured reader at numerous poetry venues around the Lone Star State alongside the state’s finest, the Poet Laureates of Texas, as well as out of state, with the Poet Laureates of Oklahoma, including a festival that featured the new, United States Poet Laureate, Natasha Threthewey. He has also been a featured poet in the states of Georgia and New Mexico and will be featured in Ohio and Alabama next year, with a possibility of reading in New York in 2013. As is apparent, he is available for readings in and out of his birth-state. Juan writes poetry on a variety of subjects like Mexican-American/Native American life, comic books, science fiction, horror, food, and the elusive chupacabra. He is also the creator and owner of the HOUSE OF THE FIGHTING CHUPACABRAS, an independent small-press that has already released the chapbook, “Unleash Your Inner Chupacabra: A Poetry Anthology By The Members Of The San Angelo Writers’ Club” (Fall 2012), with two more projects to come in 2013. Juan is a ten-year Navy/Marine veteran and former Combat medic (Hospital Corpsman) serving in the First Gulf War (1991). Presently, he is a successful public high school history teacher in La Pryor, Texas where he lives. Jean Arthur Jones is an award-winning American poet and an editor. Jean Jones is co-editor with Bruce Whealton for the online magazine Word Salad Poetry Magazine. Jean lives in the Wilmington, Cape Fear North Carolina area. Jean Jones attended St. Andrews Presbyterian College and received his B.A. in English from the University of North Carolina Wilmington. He later went on to receive an M.F.A. degree in creative writing from Bowling Green State University. Jean currently teaches Basic Skills at Cape Fear Community College in Wilmington, North Carolina. He has had two books of poetry published by St. Andrews Press from St Andrews College, North Carolina; the most recent, Birds of Djakarta, was released in 2008. He has been published in The Horror Zine, ditch, the poetry that matters, West End Poets News Letter, and Aphelion among others.